Busan Museum was pretty cool, it was dead quiet when I went in so I took my time looking at all the shiny artefacts. There is also the UN Memorial Cemetery and Peace Park nearby, so I checked that out afterwards. It was poignant if anything, a beautiful park in the middle of the city filled with graves of soldiers who perished during the Korean war. I had a sombre walk around before finding the memorial wall, with the names of all 40,000+ UN soldiers who died. The names are small, and the wall is huge. I was astonished, you can look at 40,000 and see the number, but when you see the wall with all the names, you get a real idea for the amount of lives that were lost. Worse still, the wall has names on both sides. Worse still even, there’s another wall around the back with yet more names on it. It’s astonishing. Okay, now yr just showin’ off. Right, last day in Busan now, I took Yoon’s advice and set out to go and look at Beomeosa Temple on the outskirts of the city. The subway station is on the line nearest the hostel anyway, so it was dead straight-forward to get to. Finding the temple was a bit trickier though, there were a couple of signs but I took the opportunity to do some mostly-aimless exploring. I stopped off for some delicious maki with those fish and flour strips from before, as well as bits of octopus – hey, I ate a few of them! So I followed my nose to the temple, saw a couple of signs but I found out in retrospect that they were for cars – there’s a one-way system up to the temple y’see, so I ended up going up this hella windy and long road. Was a good walk like, got some nice views so I ain’t complainin’. The temple itself was pretty nice, a bit touristy and with a fair amount of construction work going on though. Overall, not my favourite Korean experience. Y’all like stacked stones, right? Checks them turtles. I like turtles. Checks the detail in them tiles! 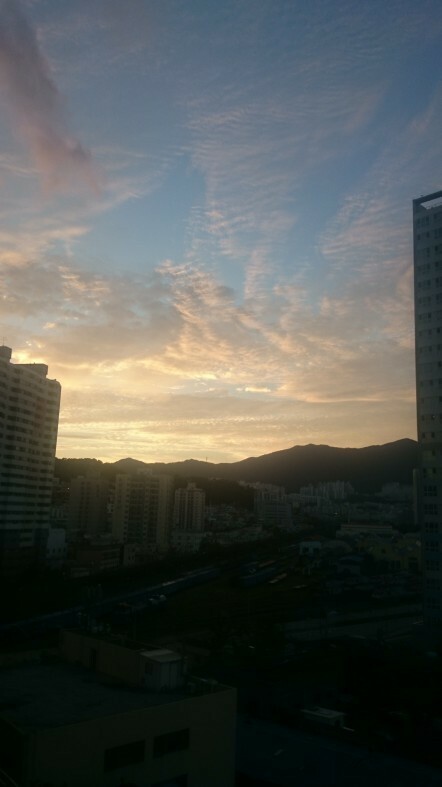 Being the last day, I thought I’d get one last look at Busan from up on the 33rd floor of the hostel’s apartment block. MORE PHOTOS! In the evening, Ye-Seul invited me over to hers as her mam was cooking some fine Korean food. And fine it was! Well, the fish with bones still in it sort of freaked me out, not my cuppa I must admit, but the beef was delicious, a reet good feed was had. Ye-Seul’s parents don’t speak any English, but her dad told her that my chopstick technique was very good. I didn’t believe her, until she added “for a foreigner”. I’ll take that! After the food, her dad offered to drive us to the top of Hwangnyeongsan (correct me if I’m wrong, Ye-Seul! And no, I didn’t remember, I had to look it up…), a mountain in the middle of the city. Of course I’m up for that! After gawping at the beautiful views and taking a bunch of photos, Ye-Seul’s family kindly drove me back to my hostel where I went up to the not-quite-top-floor-but-as-high-as-I-could-get-and-be-outside floor for another last view of Busan at night. One last kip and I’d be on my merry way to Australia. Well I say merry, but 21 hours in transit and being entirely unable to sleep on planes isn’t exactly my idea of a good time. I mean, I love flying, but it doesn’t half take it out o’ me. I tell you what though, Korea is one of the most amazing places I’ve been, and Busan is staggeringly good. I’d quite happily live there, and I’m pretty sure I’ll go back at some point if only for another visit. Is this Australia? Seriously, it looks like Aberdeen. So I didn’t get out to Kuala Lumpur as I’d originally intended, I was pretty bushed after the first flight and just couldn’t be bothered having to deal with immigration, security, blahblahblah. I figured I’d be best saving my energy for heading to Sydney two days after I land in Melbourne. So I dossed about the lounge, had a couple of beers, played some Civilization IV, and generally lounged around for six hours. It’s not so bad. Eventually I got on the plane to Melbourne, didn’t sleep, but hey, got really excited when the sun started coming up and I could actually see the country. On the descent the weather got gradually more grey and drizzly, the pilot reported that the temperature wasn’t that great either. So I left cold, wet, grey Aberdeen to come to cold, wet, grey Melbourne? Well, I stepped out the plane, and right enough, cold, wet and grey. So as this post is well behind time, I’ll have a quick round-up of what’s been happening here in Oz. I’ve been shown around Melbourne by car and by foot with Nat pointing out the important sights and Dan pointing out the important pubs, Dan and I went to Sydney for a long weekend and had an ACE time, I’ve started looking for work but am yet to settle down in a place, and the delightful Sarah has booked flights to come over to Melbourne from Auckland in late October for a wee holiday. There’s never a dull moment here, that’s for sure!